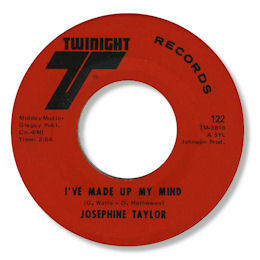 Coming from Evanston, IL Josephine Taylor had a handful of 45s in the 60s all cut in Chicago and every one of them worth checking out for her confident and musical voice. 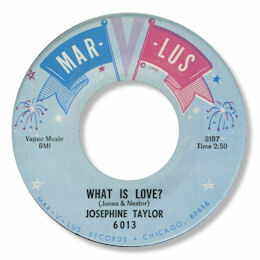 She first appeared on the Leaner Brothers Mar-V-Lus label and her best seller for them was the easy snappin' "What Is Love" one of those mid paced beat ballads that were so much a part of the Chicago scene of the 60s. The flip "I Wanna Know (Do You Care)" and "You're The Sweetest Thing" were good slow songs but sadly underproduced. But my pick from these sides is the uptempo Good Lovin' which is just the sort of hard Windy City soul that Leaner and his staff specialised in - and which seems to me to suit Josephine's great sense of timing. She moved on to Sunny Sawyer's Palos concern in 1967 and laid down her outstanding 45. The one dimensional funk of "Smooth Groove" leaves me stone cold but the other side Depend On Me is something else altogether. This is deep soul at it's best - a finely wrought song given life and breath via a really committed vocal performance. The way the horns come in on the second verse is really terrific but the killer part is towards the end when the music is reduced and slowed down like the quiet before the storm of the extended, furious run out groove on which Josephine is just sensational. Her final releases was for Twinight a couple of years later. 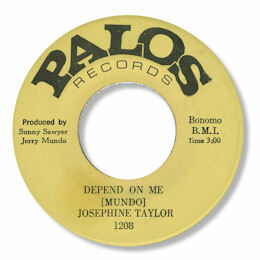 Syl Jhnson's production on the lovely I've Made Up My Mind is much more sophisticated and professional than on the Palos single but Josephine's fire still comes through loud and clear. Note the name of one "D Hathaway" on the writer credits. Note ~ The bare facts about Josephine Taylor have been taken from Robert Pruter's excellent book on "Chicago Soul". The details on her recordings and the opinions on them are mine.